This Saturday, Sunday and Monday we went to Lough Dan for a pioneering weekend. Pioneering is building things out of large wooden poles or spars and sisal. We built a cool bridge gateway thingy with platform. The weather was decent compared to what we expected. We only had light showers on the the Sunday night and a little frost and ice on the Saturday night. We all wished Emma happy birthday.So we made fire and did pioneering on Saturday. Kevin burnt his tongue on the chicken soup at lunch. After chicken curry for dinner, we played texas hold ’em poker. Tony learnt how to play slowly (by folding even when he had the best hand), Conor W didn’t have a chance and got knocked out in almost every game. We had Swiss roll birthday cake for Emma’s birthday. We turned in early that night because we were shattered from the days “work”. We slept in the next morning, only to be awoken by Tony and Emma’s loud shouts. Breakie was corn flakes (from Lidl) and bread. We continued our pioneering projects and lit another fire. The fire was built because we needed to heat the coals for the Dutch oven, which we planned to cook out beef casserole in. The casserole took 6 hours to cook in the Dutch oven, while waiting for dinner we finished. We played more poker and then goonie, and switch. We slept in again on Monday morning. Packing and go home day. We packed everything up and went back to the den to dry the tents and gear in the hall. We tried washing the Dutch oven out, but yeah, its still blackish. Currently we are having a pancake eating competition. Conor has been in the lead consistently but our guest or “ringer”, David, did arrive late so we’ll have to see. Alex from explorers has also joined us for this auspicious occasion. Alex – 4 pancakes, we think. So that is the end of the pancakes for this year be sure to join us again next year. 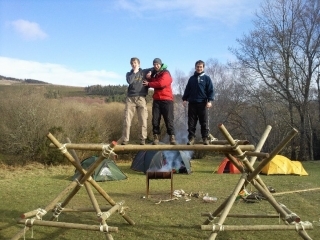 Tags: Camp, Lough Dan, Pancake Tuesday, Pioneering, Wicklow. I ate 4 pancakes. Monkey banana face flamingo alright ice cream cone? and that is my comment. I am not a loser just the 6th runner-up no shame in that, and Conor L better watch his back next year, 5 pancakes was just pathetic considering i’m only ickle and i almost beat him. Pancake party was great, well done Conor you put us all to shame. As for the weekend, I had a great time and Tony learnt that if I am jumping up and down and waving my arms he should probably bet not fold! The Rovers did a great job with planning and organising this camp, next time they may even remember to buy vegetables. Vegtab-wha???? I have no idea what your talking about Emma. The pancake eating competition was fun, as was the camp.